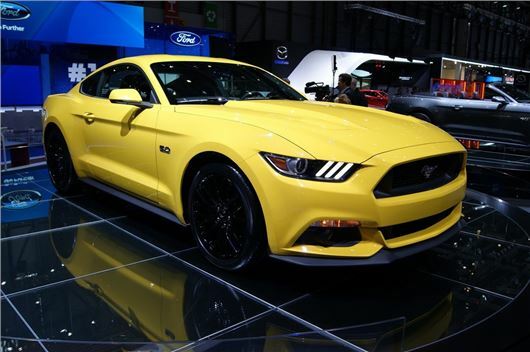 The all-new Ford Mustang has made its European motor show debut at Geneva. It's been confirmed that the latest version of the iconic American sports car will be coming to the UK in early 2015. Power comes from a 5.0-litre V8 with 426PS but alongside that is an intriguing 2.3-litre EcoBoost engine designed to offer turbocharged performance with better economy. It produces 309PS along with 407Nm of torque although there are no economy figures as yet. Alongside the standard manual, an optional automatic gearbox is available with steering wheel mounted paddle shifts. One area where the Mustang has always been found wanting is the handling and suspension. So Ford has given the Mustang all new suspension systems front and rear along with a new subframe at the front to stiffen the structure. At the rear there's an new integral-link independent rear suspension set-up. Both 2.3‑litre EcoBoost and V8-powered GT Mustang models will get performance brakes with standard 19‑inch wheels. Other features include selectable drive modes which alter the steering effort, throttle response and electronic stability control. Like the Fiesta ST the Mustang will come with torque vectoring, a system that directs engine power to individual wheels to keep the car on course. Manual models also get launch control as standard. Available as a coupe and a convertible, the new Mustang has some classic styling features like the three bar rear lights and that swooping coupe profile. The convertible version will come with a multi layer insulated fabric hood designed to cut out noise when it's closed. Inside there's an aviation-inspired interior with with two large instruments dials, while a wider body and new rear suspension should mean better elbow room plus you can apparently fit two golf bags in the boot. The Mustang also gets Ford SYNC, a touchscreen control system with an 8-inch colour screen plus a 12-speaker sound system. The new Ford Mustang will be available in right hand drive, and prices are expected to start at just £30,000 with the top V8 model an extra £5000.